Record price for newly found Chinese vase. An extraordinary price of £51m was achieved yesterday for a Chinese vase discovered in a regular clearance of a bungalow’s contents in north London. 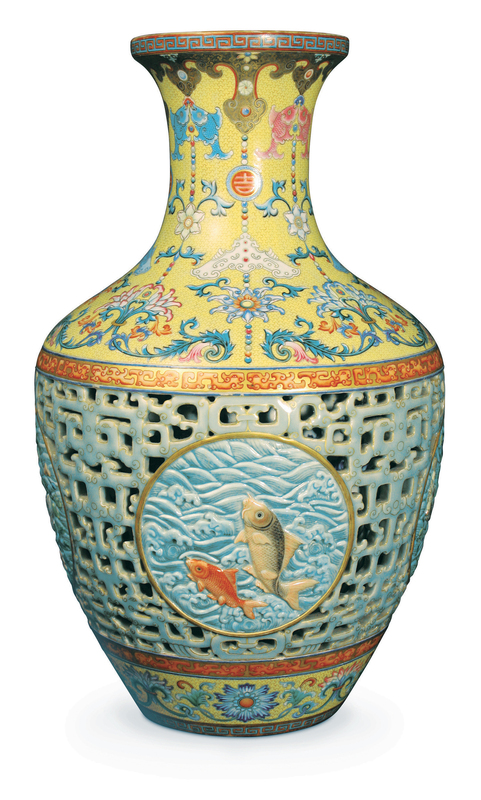 The vase, part of an inheritance put on sale by a brother and sister at Middlesex auctioneers Bainbridges of Ruislip, is from the Qianlong period, c.1740s to late 1790s, an era renowned in China for the quality and perfection of its porcelain. 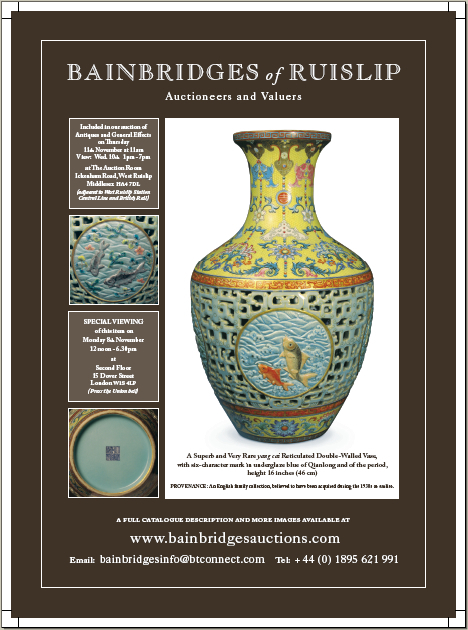 The scenes in the auction room were reminiscent of the bidding war that erupted at Irish auction house Sheppards of Durrow in March, when another Qianlong vase went from €50 to €100,000 within the space of a couple of seconds. At Bainbridges the astonished punters watched in awe as the gravity defying bids increased by increments of one million pounds at a time. The discovery of such a vase would be a major find for any auction house, but it is especially sweet for Bainbridges, a 30 year old company which is not one of the major London auction houses. The blog on the Bainbridges website (yes I said ‘Blog’, Irish auctioneers please note! ), tracked the growing excitement within the company as they came to realize the extent of their good luck and indeed that of their clients. The entry posted on November 1st, sums it up. Hyperbole not withstanding, all the research pointed to something very special. When they placed an estimate of between £800,000 and £1.2m on the vase, it was backed up by more than just gut instinct and hopeful guesswork. It is often said that all you need to get a good price at auction is to have two bidders present who want to buy the same item. If you paraphrase that to, countless bidders with newly-found riches from the orient, competing for a unique piece of Chinese Imperial history, you get what is reputedly the highest price paid for any Chinese work of art at auction. The 16in high masterpiece was eventually knocked down to a private buyer from mainland China, who unsurprisingly wishes to remain anonymous. With a hammer value of £43m, along with auctioneers commission fees of 20% (plus taxes), the buyer will eventually pay an amount somewhere in the region of £51m.